Low energy, fatigue, headaches, stress, muscle tension and spasms, trouble sleeping, PMS, hormonal imbalances, nervousness, anxiety, irritability – any of these symptoms ring a bell? Or maybe a few? Doctors are constantly touting that we all need to drink more milk to get more calcium for strong bones. But, getting too much calcium without enough magnesium creates a dangerous imbalance that can cause numerous health problems. Plus, if your diet consists of a lot of salt, coffee, sodas, alcohol and sugar, you are draining your body of it even further. Another problem is that only about 30-40% of the amount we eat is absorbed by our bodies (source). Why? Our bodies require enough vitamin B6 (eat your veggies), vitamin D (hello, sunshine!) and selenium (meat, poultry, fish & eggs) in order to be able to absorb magnesium. Diet – Eat a lot of leafy green vegetables like spinach & collard greens, avocado, nuts – almonds, cashews and peanuts top the list, legumes and seaweed. Supplement – Find a whole food supplement with magnesium citrate or glycinate taurate (easiest to absorb). Avoid the cheap supplements with magnesium carbonate, sulfate, gluconate, and oxide. 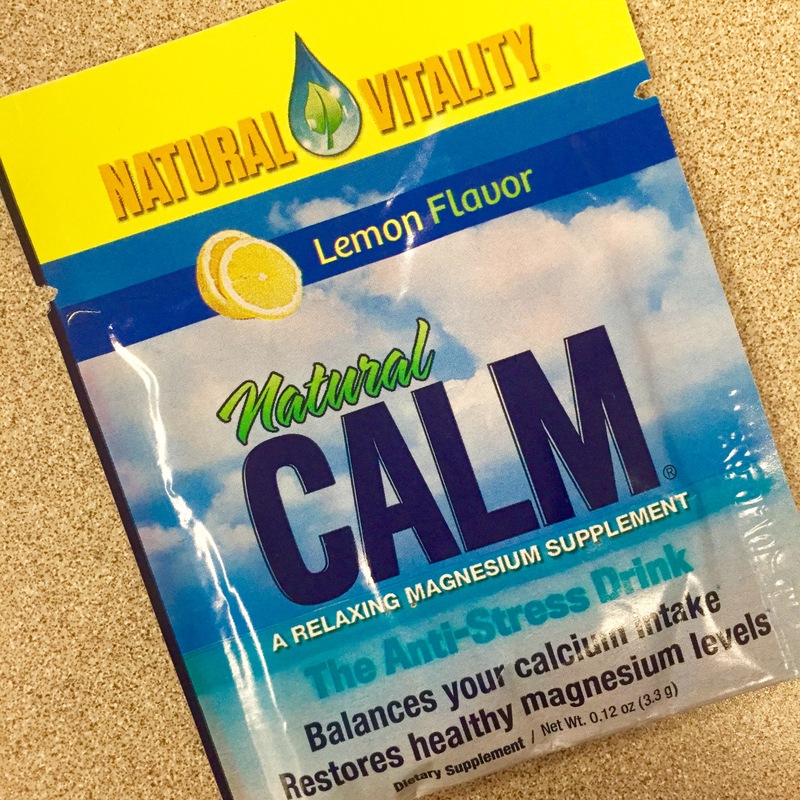 Since I take so many vitamins and minerals each morning, I like to mix it up by taking this one during the day – Natural Vitality Natural Calm Magnesium Supplement . It’s pure magnesium citrate and comes in lots of flavors; you add it to water and it makes a fizzy Emergen-C type beverage. This is the perfect afternoon pick-me-up; since magnesium helps the body relax, it diffuses any of the stress I am feeling at work. Epsom Salt Bath – Epsom Salts are pure magnesium and are recommended for relieving sore muscles. I mix up some lavender essential oil with my epsom salts in a glass jar and keep by the tub to add to my baths. It’s super relaxing and helps your body absorb magnesium before bed, which leads to falling asleep faster and better rest. Personally, since realizing that I was deficient in magnesium and increasing my intake, I have seen great results. My afternoon headaches are gone, my energy has increased, I sleep better and my stress levels are down (though that last one may have a little something to do with this too!). Are you suffering from any of the symptoms of magnesium deficiency? Think you’ll give any of the tips above a try? I’d love to hear how it helps you! One of the best things about being a wellness & food blogger is all the awesome people I get to meet who think and feel the way I do about health. It is so encouraging and reaffirming to keep on my journey towards true health. About a month ago, the CEO at Snap Kitchen stumbled upon my blog and was compelled by my story, so I was invited to meet the head chef, see their kitchen and have lunch with their Marketing Director and Chief Dietitian last week! It was a great experience, getting to enjoy a yummy wild-caught Salmon salad loaded with local veggies & goat cheese, and hear about their philosophy and passion for nutrition. I got to share how changing my diet changed my body, so drastically improving my health and about why I started this blog. They are fellow “foodies” who share in a desire for great tasting, good-for-you food. If you haven’t heard about Snap Kitchen, consider yourself told. It’s a place where you can stop in and get fresh, pre-packaged meals that are totally healthy and portion controlled. The ingredients are right on the label of each container, and there’s nothing on there that you have to question; it’s all real food. As a gal who reads labels constantly, this is such a relief – it’s not full of “modified,” something-“ized,” or other chemically altered ingredients. I saw their kitchen and there was nothing I wouldn’t have in my own. There was no freezer and extremely few “pantry” items – mostly spices. Plus, most of their ingredients are organic and local, which makes me confident about the level of nutrition I’m getting and supporting the farms in my community. I had a delicious egg white breakfast bite earlier this week with huge leaves of spinach that were so garden fresh. Their menu is seasonal and based on the freshest ingredients they can get, so you’ll never get bored with all they have to offer. The meals come packaged in BPA-free plastic containers that can be reused and are quick to warm up in the microwave. For me, they are the perfect weekday lunch. I can grab it on my way out the door each morning, rather than leaving it up to how much time I might have to go grab something nearby or sticking with my boring everyday salad. This week, I enjoyed crispy chicken “breaded” with nuts over veggies, beef stroganoff with greens and butternut squash & turkey macaroni. Having grown up on comfort food, I crave it constantly and love finding guilt-free versions of those meals that actually taste good. I can’t wait to try their quinoa “mac & cheese” and vegetable lasagna. 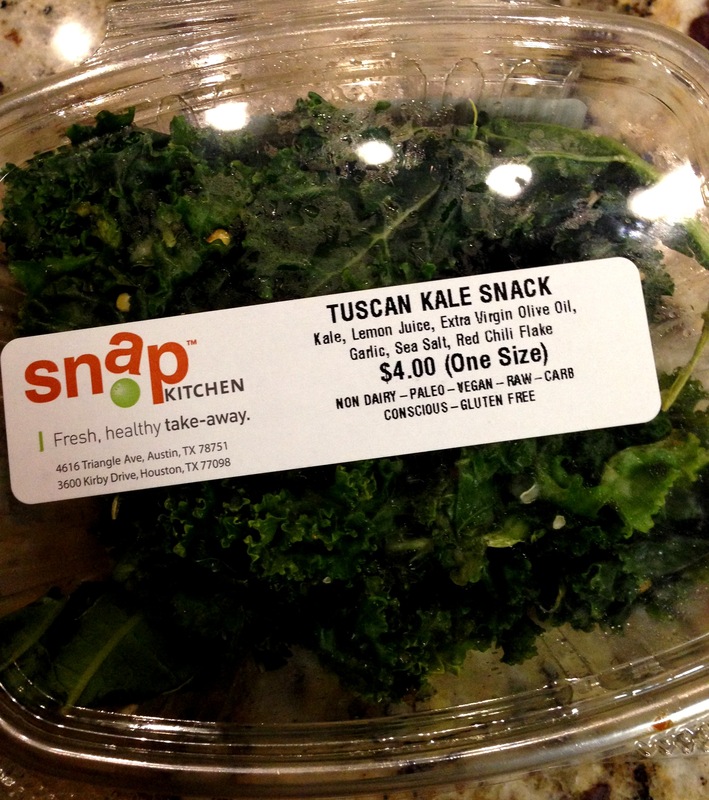 This is what my husband picked when we visited… I wish I had his love for kale! As I’ve mentioned before, I am paying particular attention to avoiding inflammatory foods, and Snap Kitchen is perfect for that. They don’t use canola/vegetable oil – only olive oil and grapeseed oil for their cooking (if only I could convince them to use coconut oil! ), they use very little sugar, the soy is easy to spot in the few meals it’s in and with lots of paleo and vegan/vegetarian options, I can get the protein and veggies I need while avoiding grains and not sacrificing taste. If you are a fan of My Fit Foods (or just looking for a better on-the-go option), I highly recommend you try Snap Kitchen. You will appreciate the real ingredients in their foods, knowing that you are really getting the nutrition you need to be healthy. Portion control isn’t everything, y’all.. this is all about getting well. Plus, if I’m being honest (I don’t make any money from this blog, so I can say whatever I want, right? ), the food simply tastes better. If you’re in Austin or Houston, you’ve got to check it out and let me know what you think! If you’ve ever seen Fat, Sick, and Nearly Dead, you’ve probably wondered about the benefits that juicing and a raw diet could provide for you. 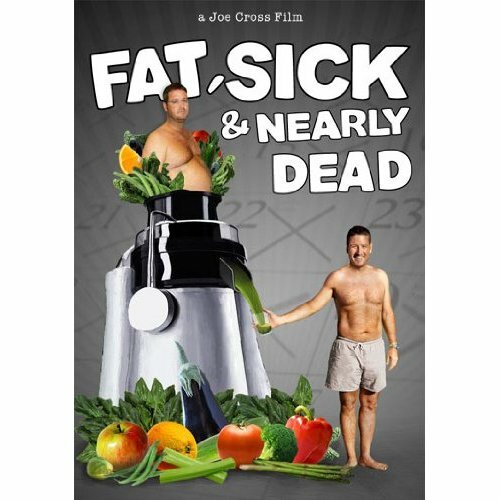 Joe Cross was overweight and experiencing health issues that doctors could not find answers to (but had no problem prescribing him lots of pills for); finally, he met a natural doctor that told him that eating well was the only way to heal himself of his autoimmune skin disease. So he decided to go on a 60 day organic juice-only fast, followed by months of only fruits, veggies, nuts and beans. He loses an incredible amount of weight and experiences an amazing health transformation. If you haven’t seen it, I highly recommend watching it on Netflix – it’s very inspiring. Fresh juice is nothing like the high fructose corn syrup sweetened and artificially flavored and dyed stuff you find in the grocery aisle. When you juice from real fruits and veggies, you are getting tons of real nutrients. You can pack pounds of these healthful, fresh items into just one juice. Plus, since you’re juicing out the fiber, your body is able to quickly absorb all those vitamins and nutrients rather than spending energy to digest them. If you believe in eating the hunter-gatherer way, then fasting is especially important as, naturally, there were times when food could be hard to come by. Our bodies are designed to need a break every once in a while. And raw, fresh foods are part of the Four Pillars of World Cuisine. The raw fruits and veggies in juice provide our bodies with potent antioxidants essential to combating harmful free-radicals (the molecules that cause every kind of disease, especially cancer). Bonus: The major ingredients in my juices were 4 of the 5 best alkaline foods – lemons, cayenne pepper, leafy greens and apples. Why does that matter? Basically, our bodies are designed to keep a neutral pH level, but with all of the processed foods we eat, we often end up being highly acidic. Being acidic can majorly affect your health by diminishing your immune system, causing fatigue, pain and even cancer. The more alkaline and less acidic foods (the list may surprise you) you can eat to balance out your system, the better! So, I had watched documentaries, read articles about and heard of friends doing juice fasts/cleanses and wanted to try it for myself. Although it was recommended to “pre-cleanse” by weaning off meat, dairy, sugar, wheat, etc., I didn’t. Let’s be honest, most of us try a cleanse because we’ve been eating junk.. I did the cleanse because I wanted to break my taste for those things and get back on track. I did eat a little healthier and did no alcohol or caffeine as well as only eating fish and veggies for the 48 hours before so it wouldn’t be too bad of a shock. I had looked into buying all the juice for my cleanse from a couple of local companies like JuiceLand and Skinny Limits, but when prices were coming up at $175-200 for an organic cleanse, I looked into the DIY option. I found some recipes online here and here that imitated the well-known BluePrint cleanse, borrowed a Jack LaLanne Pro juicer from a friend and then went shopping. I only spent $68.61 on organic fruits and veggies. So worth it. Now, the juicing took about 3 hours total, but considering I usually spend about an hour and a half each day preparing breakfast, lunch and dinner, that’s really not any different. It was super nice to come home from work and have my “meal” already made and let my husband fend for himself. I started with all these fresh vibrant fruits and veggies, which was more produce than I usually buy in a whole week. Biggest surprise? How much I liked the juices. The green juice was delicious… a little celery-y, but super yummy. The cashew milk that everyone seems to love was the most disgusting thing ever. I only had it the first night and barely kept it down. I had more green juice the second night. Biggest regret? Not starting an awesome compost pile with all the fruit and veggie pulp that the juicer collected. Guess I’ll have to do it again! Was it awful? Overall, I was really hungry the whole time, which is normal, but tough. Watching tv was hard and commercials made me crave donuts and pizza. They say that since your body is being detoxed, you could feel terrible… I really didn’t. In fact, I had more energy than ever. During the fast, I was kind of wondering if it was worth it and it wasn’t until afterwards that I realized it was. I totally lost my desire for junk food and coffee and alcohol, and felt sick whenever I had those things, which definitely helped my self-control. I also lost 4 pounds which I have easily kept off since. Ultimately, I would recommend the experience to anyone, especially those suffering from sickness or trying to break bad food habits. I will absolutely be purchasing a juicer and making juice part of my normal routine so that I get more nutrients into my diet in a delicious way. 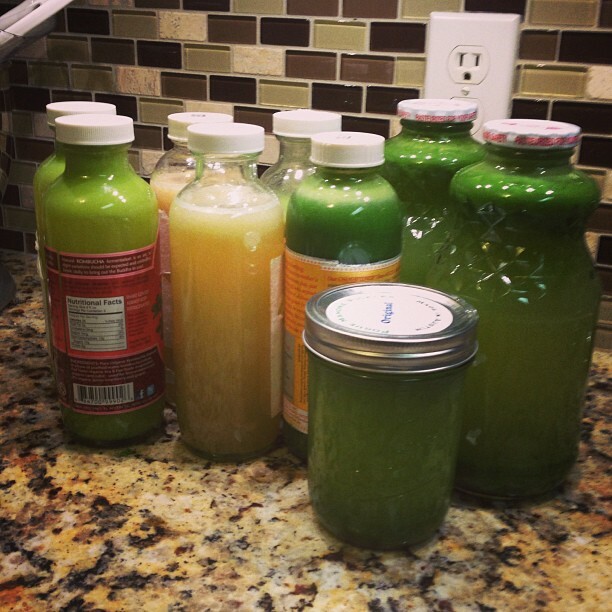 But, if I ever do a cleanse again, I’ll want a buddy… it was hard to do it alone! So, what do you think? Would you ever try a juice cleanse? Yesterday, I shared part 1 of my review on Gary Taubes’ book, Why We Get Fat: And What to Do About It . His arguments really hit home with me, and I’m sure did with a few of you as well. So, naturally, the next step after realizing why we are getting fat is figuring out what to do about it. “Not all of us get fat when we eat carbohydrates, but for those of us who do get fat, the carbohydrates are to blame; the fewer carbohydrates we eat, the leaner we will be.” It’s frustratingly beyond our control if we are predisposed to get fat, but at least there’s a solution. Not all carbs are the same… Leafy green veggies have lots of fiber that take a while to digest and therefore the carbs don’t cause blood sugar levels to spike. But, cheap carbs, like bread, pasta, potatoes, rice, beer, soda, and all processed foods, have highly concentrated amounts of carbohydrates and are easy to digest. That means the glucose quickly enters our bloodstream, causing blood sugar to spike and with that insulin levels to go up. Fruit, while not as carb-concentrated, is easy to digest and therefore might have a fattening effect on the most insulin resistant people. The worst effect comes from a diet filled with fructose and highly sweetened food items. Our livers are not designed to handle the sugar overload and respond by turning it directly into fat. So when fructose is consumed with glucose (all those yummy processed foods/cheap carbs), insulin levels rise and start storing all that fat away instantly. It hastens the effect of carbs. This explains why some carb-heavy cultural diets, like in Asian countries where rice is a staple, don’t have a fattening effect: because they also eat traditionally very little, if any, sugar and have otherwise healthy, lean diets of fish and veggies. We’re addicts. The more insulin resistant we become, the more insulin that’s constantly flowing through our bloodstream, craving a quick fix of glucose for fuel; that’s why we constantly crave those carbs even when we try to eat healthy and feel truly full on meat and veggies. The solution is as radical as breaking an addiction: eliminating those cheap carbs completely to break the habit. This is why many on the paleo diet are so successful in losing weight over many vegetarians/vegans, who often supplement their plant-based diet with carbohydrates. Paleos are eating the way our ancestors did as hunter-gatherers – high protein & fat from meat and lots of wild plant foods that are low in carbs and low on the glycemic index. Ultimately, Taubes suggests consuming fewer than 20 grams of carbohydrates per day and eliminating sugar completely to correct your weight. Beyond the benefits of losing weight, you will also find that your body starts healing itself naturally (the way God designed it to), since sugar actually suppresses your immune system for hours every time you consume it. Order his book here to learn more! If all of this text has been a little overwhelming for you visual people, here is an awesome infographic that explains most of what I’ve summarized from his book. Enjoy! So what do you think of Taubes’ argument? Will you read his book? Will you go carb & sugar free?